I hope there's no need to introduce Walter Becker and Donald Fagen (aka Steely Dan) to anyone. They are, without doubt, one of the most widely appreciated pop duo's, since their early days ('70s). Their classy mixture of pop, R'n'B and jazz is hard to describe but once you listen to it you become addicted. I own everything from Steely Dan, including, of course, "The Nightfly", an audiophile "must" solo album by Donald Fagen. "Two against nature" (2vn for short), released in 2000, has been their first studio album after 20 years or so. Their last album, before this one was released, was "Gaucho" (1980). Twenty years without a new Steely Dan's album are a long wait and Fagen's "The Nightfly" (1982) and "Kamakiriad" (1993) solos - though truly excellent - weren't enough to satisfy their fans' needs. A new album after 20 years of almost complete silence is a tough challenge for every artist. 2vn is the proof that World-class artists (like Becker & Fagen are) can keep their legend alive quite easily. Just listen to this album and you realize that 20 years have passed without leaving a trace. Their songs retain all the freshness of their earlier works. 2vn is a real masterpiece, nine sparking tracks of their fine, classy, unsurpassed pop, funky & jazz cocktail. It's hard to define their Music as "easy listening" since they are not "Top 10" composers, though some of their songs have been "hits" sometime. As you may know, I'm reviewing this album not because of its artistic content (winner of four Grammy awards in 2001, need I say more) rather because it is a truly audiophile recording. This is not a surprise, considering the outstanding technical quality of ALL Steely Dan's albums. Even the older ones (such as Pretzel Logic, 1974) were albums ahead of their time, from a purely technical point of view. And "The Nightfly" has always been a "test disc" for audiophiles worldwide, especially the vinyl release, despite the fact it has been one of the first digital masters of Pop Music made available. 2vn is outstandingly good and a real test field for any HiFi system. It's all digital - though analog tapes were made, more on this later - without the typical DDD limitations: it's crisp and dynamic without sounding edgy or harsh. There are two aspects that immediately catch listener's attention: dynamic range and bass frequencies. You should hope your system is capable of handling - without compression - the high dynamic jumps this recording contains. If you detect some compression....it's hidden in your system somewhere (amp or speakers). Percussions and drums are incredibly fast and crisp and they should remain so even when reproducing loads of bass frequencies. This is not an easy task, as this album has a bass range that's incredibly deep and articulated, powerful and tight, precise and coherent like it rarely happens, even on "audiophile" recordings. You shouldn't be surprised to learn that one of the four Grammy Awards was for the "Best Engineered Album/Non Classical" category. This is a real audio masterpiece. Dynamics and bass range aside you'll also discover crystal clear vocals and even an incredibly stable and wide 3D soundstage, which is a rare thing to find on Pop Music albums. I consider 2vn a high resolution recording: with the right system it reveals a quantity of musical informations that is simply stunning. It may sound artificial and cold on "wrong" systems. If that's your case behave accordingly! Would you taste a fine Italian wine such as the Brunello di Montalcino using a disposable paper cup? Personally I use each and every track of 2vn to evaluate HiFi components. Just to name a few: "Jack of speed" to test PRaT (Pace, Timing & Rhythm), "Two against nature" and "What a shame about me" for bass depth and articulation, "Cousin Dupree" for vocals. You might find other tracks useful for different "testing" purposes. [...] However, at the time the album was mixed, a set of high quality analog master mixes was made along with the digital ones, and, knowing that some people still prefer the vinyl format, we are exploring the idea of using these tapes to make a vinyl pressing at some time in the future. We'll keep you posted on this possibility as time goes on. So...keep the faith and, eventually, drop an e-mail to the SD website asking for a vinyl release of "Two against nature". It would become an "instant classic" for vinyl lovers, as it happened to "The Nightfly" 20 years before. This is an excellent album and an outstanding recording. In other words, a "must-have". A seducing "must-have". 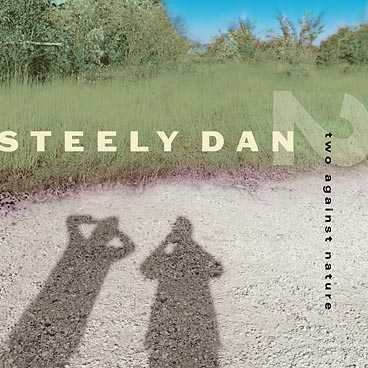 If you don't know Steely Dan, this can be considered a very good way to start with.